My next block for the 2020 challenge is done! 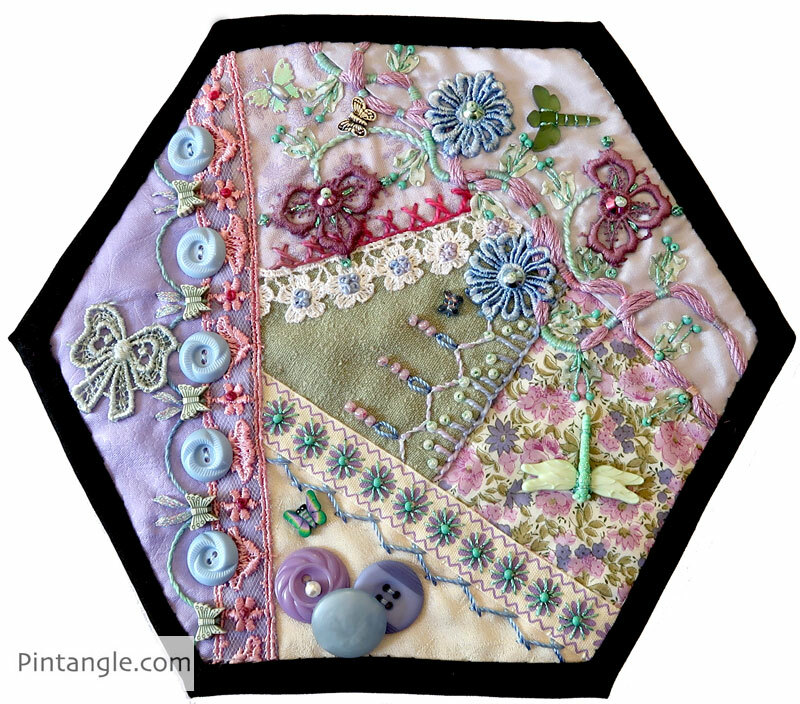 As you can see, I had fun with 2020 crazy quilt block 11. This was my starting point for the 2020 crazy quilt block 11. 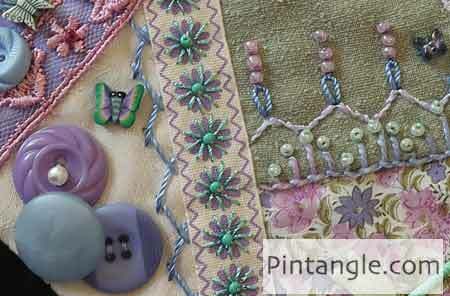 As I have said before, I have noticed that beginners often worry over the look of an unembellished crazy quilt block. Many blocks start out looking distinctly dodgy. The thing you learn, however, is that by the time a block is embroidered and embellished, it looks totally different. Every time I share one of these blocks, I also share a photo of the unembellished block so that beginners don’t feel so worried about the block they produce. 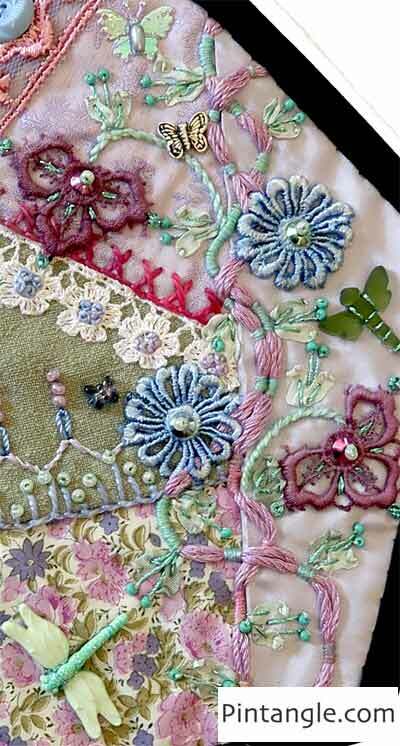 Stitching adds another layer of visual interest and can often pull a block together while embellishing. So, if you are new to crazy quilting, don’t fret too much about how you begin. Just keep on stitching! 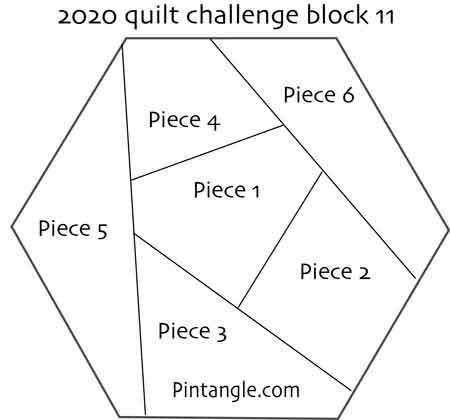 Feel free to use the basic pattern of my 2020 challenge Block 11 if it appeals to you. My hexagons have 4-inch sides and measure 8 inches across from point-to-point, but you can use this pattern for other sized hexagons too. 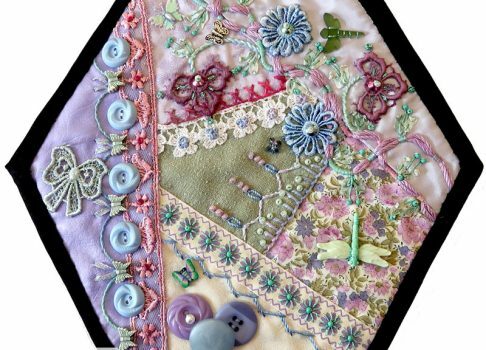 Before I discuss the embellishments, embroidery and details on 2020 crazy quilt block 11, remember that the aim of the 2020 challenge is to use 2,020 different items on a quilt by the END of the year 2020. (I emphasise END because some people feel they don’t have time to do it – this is a big hint … you do!) Items that are the same can be used twice on the quilt but must only be counted once. A counted ‘item’ can be material, an object (such as buttons beads etc), an embroidery technique (thread painting, Brazilian embroidery, ribbon embroidery etc) or a type of stitch. The first photograph highlights a small button cluster set beside the seam, which is covered with a patterned ribbon. I worked herringbone stitch alongside the ribbon using a rayon thread. On the ribbon itself, I worked straight stitches using a green metallic thread. Here you can also see whipped back stitch above a line of buttonhole stitch. On this side of the block, I couched a thicker mauve pink thread that attracted me because it has little silver metallic highlights in it. I also scattered a good few butterflies about. The little organic leaf motifs are stitched in silk ribbon and the same green metallic thread used on the other side of the block. The lace flowers have a dome shaped bead in the middle. The last detail is a seam which I covered with a hand dyed lace. Using my templates I marked the scallops and stitched them in stem stitch using a hand dyed cotton perle #8. What is the count on 2020 challenge block 11? 2020 challenge block 10 brings the total of items used to date to 302! A useful printable resource for everyone! I get many questions about managing and tracking the count of items, as it’s a bit of a task in this challenge to keep track of what you use. I have some wonderful news about a shared resource that helps with this! Janis Stoker of Journeys With Janis has incorporated all the suggestions I made for things you might count in the challenge and has created a PDF printable to help you keep track of what you use! Janis has generously offered to share it and share it with you all! If you can use it for the challenge please do so – you can download this printable here. No strings attached – no email required or anything like that. I would like to thank Janis for making this handy tracking sheet available to the community. Sharon you are such an inspiration. Thank you so much for sharing all this information, photos and blocks. 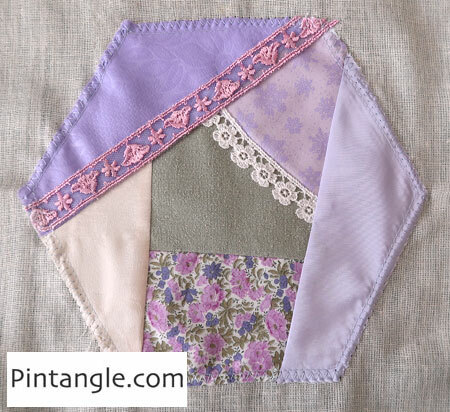 As an absolute beginner to crazy quilting I love seeing the transformation of a block/hexagon to the finished article. Yours are wonderful! Gorgeous Block Sharon! I particularly love how and where you couched the pink and metallic blend thread. Thanks for sharing. Sharon, each of your hexagons are beautiful! I can stare at them and each time, learn something new. Thank you! I am about ready to back and face my hexagons. I read somewhere about using Pellon iron-on batting and then the backing. Is this something you do? Also, may I ask what kind of fabric you use for the backing/facing? Thanks again. I really appreciate all you do! 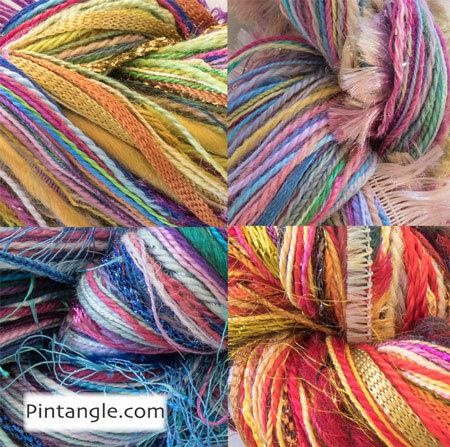 I am soooo looking forward to my thread twisted! Great idea. I am fairly new to hand embroidery but very familiar with wool, cotton, linen and silk fabrics as I dye fabrics. Thank you for your suggestions and instructions.